If you liked the I-pod, the I-pad and the I-pod touch, you're going to love the Chai-Pod T-shirt!! Load you're Chai-pod up with insane beats such as "Hava Nagila - Bar Mitzvah" by MC. Rabbi Nachman and dance the day away in a spiritual Trans frenzy! 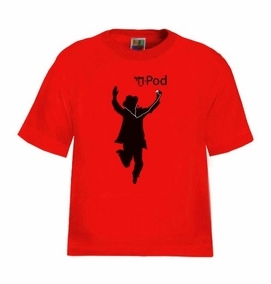 Make your I-pod a Chai-Pod by wearing our awesome Chai-Pod T-shirt today! (Unfortunately, the Chai-pod touch will not be issued in the Hassidic edition. ).Made from 100% Music & Combed-Cotton (High-Quality Cotton) T-Shirt, unique and hard to find. Our t-shirts are made of 100% cotton and are long lasting with bright colors. Our products are all designed and printed in Israel.